The Windham Middle School football team showed some promise during a scrimmage against Portland at the Deering turf field last Friday evening. First, on the defensive side, newcomer Blake Houser intercepted a Portland pass in the end zone keeping the opponent from scoring. Then on the varsity team’s last offensive possession, tailback Treva Valliere pounded his way into the end zone scoring for Windham as time ran out. It was a fitting transition for Houser, who moved to Windham from Texas earlier this year, as he announced his arrival on the Windham scene. He replaces Valliere at quarterback and will play safety on defense. Coaches, parents and teammates are all optimistic about the team’s chances with the transplanted Texan under center. Houser will be taking snaps from Blake Colby who anchors an experienced offensive line that includes Braxton Cassidy, Logan Douglas, Ricky Brichetto, Jack Alderman and tight end Josh Mora. In addition to Valliere, expect Grant Jacobsen, a punishing north-south fullback, to see time in the Eagles’ backfield. Houser also has some versatile wideouts including Garrett Peeples, Rich Graham and Parker Varney to catch his passes. Peeples and Varney both had some quality receptions in the Portland scrimmage. Look for speedster Michael Fahey to also see plenty of time on varsity. Among the defensive highlights heading into the season are the linebacking trio of Jacobsen and Valiere, while up front nose tackle Colby and defensive end Brichetto wreaked havoc on the opposition at the end of last season. Head coach Tony Leslie is working with assistants Rusty Babb, Mark Wall and we’ll just call him Coach G, because no one can spell or pronounce his real name correctly. On the junior varsity side, some intriguing prospects include quarterback Anthony Guliuzza, Noel Redlon and defensive juggernaut Mattingly Babb. Another JV stalwart who should see some varsity time is Seth Wall. 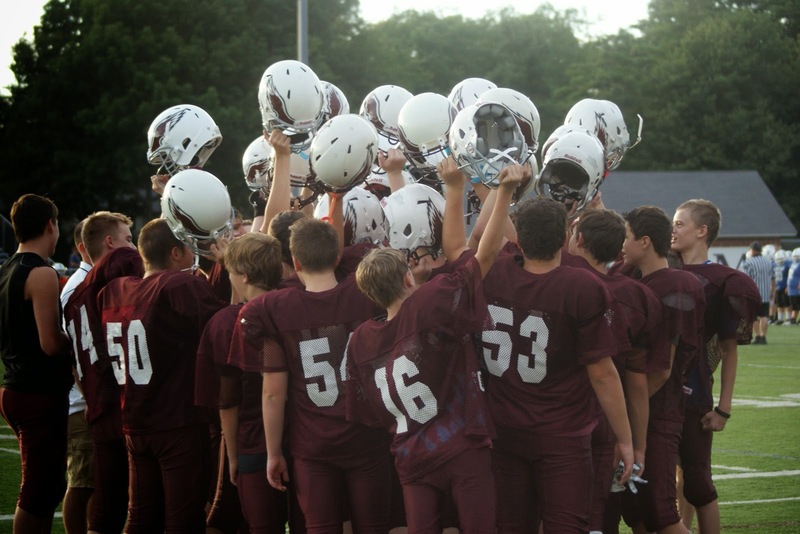 The Windham Middle School’s 2014 season starts at home against Sanford on Sunday August 23rd. On Labor Day Weekend, they play at South Portland on Sunday at 1 p.m. if you’re looking for some inexpensive entertainment. On September 7, Windham hosts Scarborough and then on September 13 is a tough battle against neighbor Bonny Eagle. 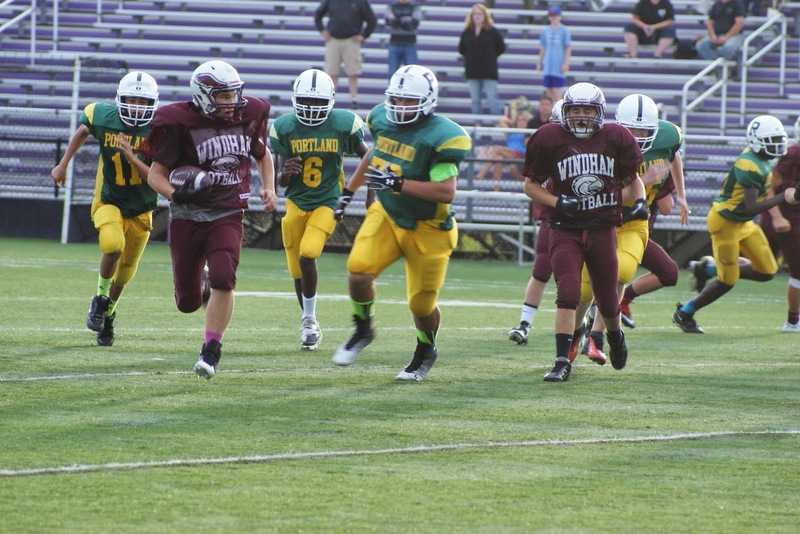 Windham hosts a difficult Portland team on Sunday September 21 and the following week takes on Massabesic as the teams start to gear up for the playoffs. Finally, the season wraps on up October 5 when the Eagles travel to Saco. Playoffs begin October 11 and, based on the pre-season scrimmage against Portland, Windham hopes to be a contender. For calories' sake, it's best to avoid all sweetened sodas, sweetened or flavored coffee drinks, and sweetened tea. Replace these high-calorie drinks with water, skim milk, and unsweetened herbal tea. Because while they taste great, liquids generally don't satisfy hunger, so they are just empty calories. Research has shown that those who skip breakfast actually weigh more than those who eat three meals a day. Skipping a meal usually causes you to eat more calories during the day. You will end up eating even more food later in the day because you're so hungry. To eat a little less, use smaller plates and eat slower, it takes about 20 minutes for your stomach to signal your brain that you are full. Also, remember that portion control also applies to healthy foods, as they, too, contain calories. A salad is a healthy, low calorie option. At least until you add dressing, bacon, cheese and croutons. One tablespoon of dressing contains 75 to 100 calories. With that in mind, it's no wonder grilled chicken salads at a fast food restaurant can have more calories than a hamburger. When it comes to a successful diet, make rules for appropriate times to eat. And don't always feel the need to eat when relaxing. Try sipping on water, tea or chewing gum. Dieters often become overzealous in their plan and completely rid the house of all the food they enjoy, whether chips, sweets, snacks or any high calorie food. Remember that everyone makes mistakes, but be smart and don't let these common pitfalls keep you from meeting your health and fitness goals! Reach your fitness potential faster by coupling your good diet with a challenging exercise program. It’s no secret that people are larger today than ever before. Waistlines have expanded over the last forty years and studies show that portion sizes have grown as well. Today, a large cookie has about 275 calories. This is 220 more calories than a cookie 20 years ago. Today, a 3-cup chicken Caesar salad has 790 calories. This is 400 more calories than Caesar salads 20 years ago. Now that you know portion sizes today are far larger than you really need, what are you going to do the next time you go out to eat? Try the following three tips and watch as your waist begins to slim and your confidence soars. Realize that it is okay to leave food on your plate. Eating everything on the plate is probably a habit now, but it is one that you can break. Focus on how you feel halfway through your meal. Are you full? If you are beginning to feel full then stop eating. Don’t worry—your mom won’t send you to your room!